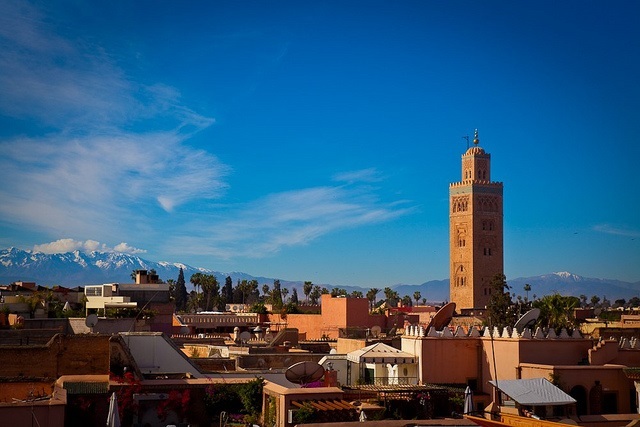 Marrakesh is a city of contrasts, located right in the center of Morocco. When you get off at the city’s central square, the Jemaa el Fna, it is like stepping back in time, a time when ancient traders used to roam the Sahara and the preferred mode of transportation was the camel. Immediately, you get the feeling of being in one of the stories of a “Thousand and One Nights”. There are snake charmers playing their instruments with a very distinct high-pitched almost hypnotic sound, women covered up head to toe offering to give out henna tatoos and a variety of different scammers trying to sell you anything from spices to little trinkets. The square then leads into the souks and a variety of winding side streets, in which you can get lost very easily and wander around for hours. Yet Marrakesh also has its modern side. If you walk up the Mohammed V. road away from the Medina and the souks, you arrive in the new part of town, the Gueliz, which has a totally different feel. It is as if you have arrived in a typical city in southern Spain. The Gueliz is filled with bars, shopping malls and also fast food restaurants and does not differ from anything that you would find in southern Europe. I have been planning to go to Morocco for a while now, but finally decided to go for it and booked a ticket to Morocco. The good thing is that several of the cities in Morocco now get regular low-cost carrier flights, such as with Ryanair or EasyJet. Unfortunately I booked a rather late, so my Ryanair ticket was rather pricy, but still doable. The Marrakesh airport is pretty small, but it takes a long time to get through immigration. So when flying there, take into account that getting through immigration could take up to an hour or even more at busy peaks. After getting through immigration, you have either of two choices to get to town, taxi or bus. There is a bus (bus number 19), which goes from the airport to different parts of the center (with the main fixed stop being at the Jemaa el Fna). The bus has very few set stops, so if you tell the driver what hotel you are staying in, he will most likely take you there. The trip one way costs 30 dirhams (the exchange rate is around 11 dirhams for 1 EUR). The problem is that the bus has no fixed schedule, but comes approximately every 30 minutes, so you might end up standing at the bus stop wondering whether the bus will come at all. While standing at the bus stop (which you get to by turning left when exiting the terminal building and walking towards the big sign with “Bus” on it), you will most likely get hassled by taxi drivers trying to get you into their taxi. This is the first sign of what you will most likely be encountering very frequently throughout your stay in Marrakesh (especially in the old part of town, the Medina). At first they will be quoting you outrageous prices. However you can bargain with them. To get more reasonable prices, the tip from the internet is to go away from the rows of taxis standing in front of the terminal, and instead go to the round about and catch a taxi there. There you should get a more reasonable price. The guys will start quoting you prices from like 200 dirhams, but the usual price should be around 40 dirhams from the airport to the Jemaa el Fna (the locals probably pay less than that even). Initially when I got out of the terminal, I wanted to take the bus. I went to the sign saying “Bus” and waited. The bus wasn’t coming for a while. At first I was standing alone, but soon was joined by other tourists. I am a pretty gullible person, but from these other tourists I got to see how easy it is for the local scammers to scam the clueless tourists. Keep in mind that the already inflated average tourist price for getting to the Jemaa el Fna should be around 40 dirhams (it’s just a short 10 or 15 minute ride from the airport) and the bus to the center costs 30 dirhams. The other tourists standing at the bus stop were two couples. A taxi driver approached them and said that he could give them a “special deal” and take everyone into town for the “low” price of 30 dirhams EACH. The other guys enthusiastically agreed. Since it was my first time in Morocco and I didn’t want to stand alone at the bus stop (at that time I didn’t even know whether that was in fact the stop), I decided to go along. The taxi driver squeezed 5 people into his taxi (the legal maximum is 3 passengers) and off we went. He did get us to the center, but he made a killing for the ride. That’s 5×30, which equals 150 dirhams, when the already inflated taxi price should be 40! I am usually pretty clueless, but the cluelessness of the other tourists in Marrakesh borders with retardedness sometimes. This keeps the level of scaminess at extremelly high levels. It seems like almost everyone is out to scam you. This then ends up with you getting paranoid sometimes. The thing is that the Moroccans are pretty friendly people, however in Marrakesh, you don’t know whether they are being friendly because they are genuinely friendly, or they are trying to scam you. In the center of Marrakesh it’s most likely the latter, so be careful and err on the side of caution. What you will notice instantly in Morocco is all the chaos. There are cars and scooters, and donkeys everywhere, people walking everywhere. There is an absolute disregard for any type of rules. The common way of crossing the street is for people just step into the street and walk across, no matter what type of traffic there is. If you want to get anywhere in the city, you will have to adapt. The number one thing that most tourists do is visit the Jemaa el Fna, the main square in the old town and all the souk with its windy little streets around. Be careful there, since even in these little windy streets there is a lot of traffic, especially guys going around on scooters really fast and also donkeys! In some streets you might even get cars. I actually got hit by a car walking on one street. Luckily it was going really slow, but it hit me from behind and almost ran over my leg! Apart from that, you can also visit several old palaces to see how the old elites used to live. You have the Bahia Palace, which is intact and dates mostly from the 19th century, and you also have the Badi Palace, which are huge ruins of an old palace dating from the 17th century. There are also other palaces besides there. Another important landmark are the Saadian Tombs. These are the tombs of the Saadian dynasty from the 16th and 17th centuries. The members of this family, as well as many important people from Marrakesh from that era are buried there. After the fall of this dynasty, these tombs were walled up and hidden by the subsequent rulers and were rediscovered only at the beginning of the 20th century. The problem with getting to any of these places is that you will most likely get lost on the way! The way to get to these places are through the little windy streets of the souks and those can lead you anywhere. The souks are a good place for people wanting to shop for different souvenirs and other things. However you will have to haggle for the price. The seller usually starts off with some outrageously high price and then you come up with a counteroffer and after a while you should arrive at a mutually satisfactory price. These guys are good, so come with your A-game. While Morocco is officially a Muslim country, it is also a very good place to party. Marrakesh is known for its nightclubs. For example Pasha has a branch here and there are plenty of other clubs, especially in the part of town called the Hivernage. Plus I shouldn’t forget to mention that Moroccan girls are hot and especially in the new part of town, you can see many dressing very nicely, including some in mini-skirts. Beer is served in many places. I made that mistake. And this was the reason for my epic quest to find a place where you can drink beer. It was the first night of Ramadan and me and one other guy at the hostel didn’t feel like sitting around and decided to go out and find somewhere to drink some alcohol. I had taken a walk to the Gueliz (new part of town) previously during the day (when it was really hot and I burnt my neck) and knew that there were a bunch of bars there. We walked all the way to the area behind the McDonald’s and the mall, even checking out the sidestreets. There were many people walking around in the streets, chatting and just sitting around, however there were no bars that were serving alcohol. At least we didn’t see any. We walked around, up and down in different places, but nothing. After a while we decided to give up and head back to our hostel, which was located in the Medina. We were walking back dejected, when my friend noticed a sign for a bar and on the sign there was the magic word: “beer”. We decided to head in and yes they were serving beer! One of the few bars in town doing that on Ramadan. Our epic quest came to a happy end (no pun intended 🙂 ), we found what were looking for. You can find a lot of information on the internet. Before going to Marrakesh, I would recommend to do a little research. Look at Google maps and do some mental walking in the streets, especially noting the places you want to visit. 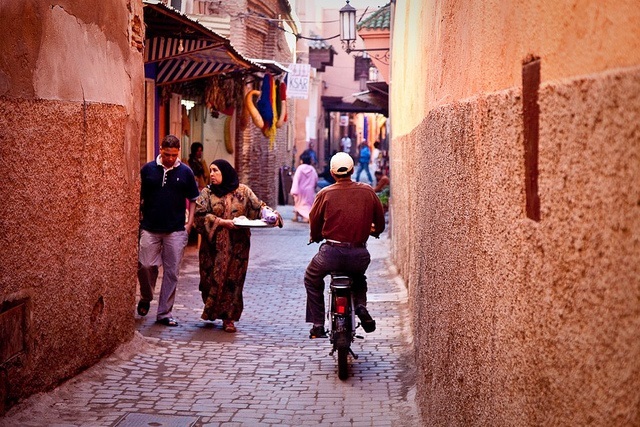 Also do a search on the common scams you are likely to encounter in Morocco and be wary of them. In this way, you will be way ahead of the majority of the tourists visiting the country.